I always knew I wanted to do cloth diapers for our babies. Something about it going against the grain I suppose, I wanted to do things a bit differently than the majority. I LOVE cloth diapering and have never had an ounce of regret. When I was pregnant I began to research a bit about how to start, how to wash, which diapers are best etc. In the end my greatest resource was going to a local boutique that specializes in cloth diapers and asking questions, they were super friendly and incredibly knowledgeable. I thought I’d go through our diaper routine and add little tid bits here and there so you can get a glimpse into the world of cloth diapering. 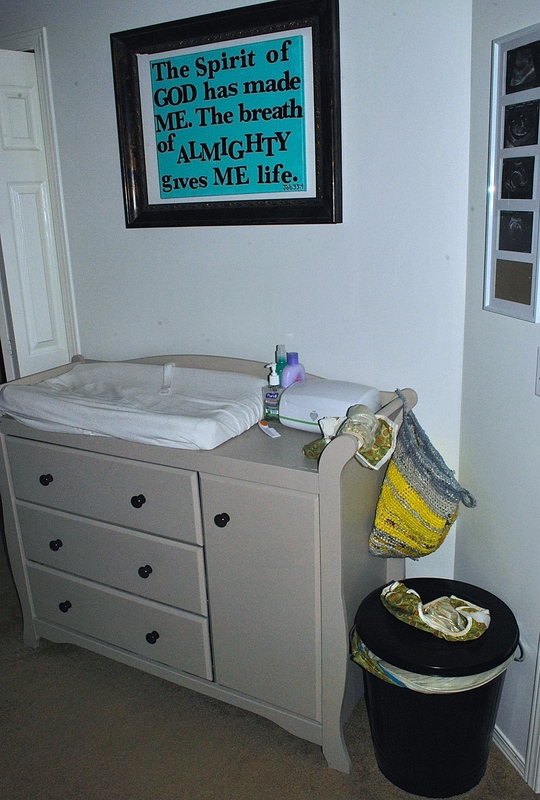 This is our changing station. I suppose one downside to cloth diapers is that you are stuck having to change your babe in a specific place. For me this wasn’t a con because I love the routine, and definitely love the organization factor. 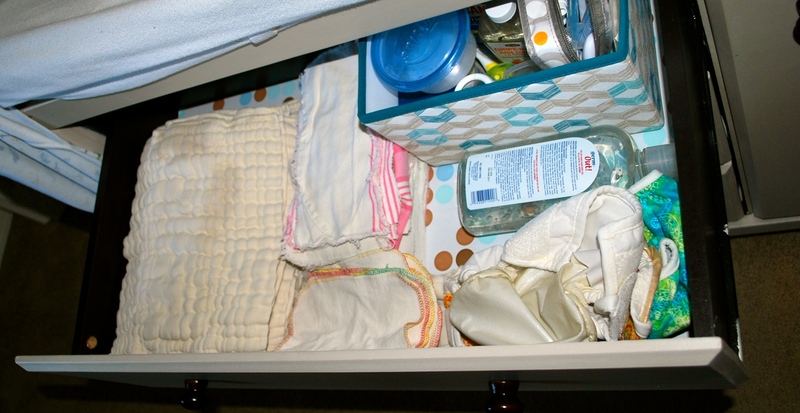 All things diapers and baby care live in the top drawer. Liners to the left, flannel inserts to catch the poop in the middle, right in front of those are reusable wipes, the basket holds tylenol, gripe water, syringes, thermometer etc. etc. Then in front to the right are the covers, and extra hand sanitizer. You can use flushable inserts for after your baby starts solids, or if you are formula feeding and it’s pretty simple to just throw the liner in the toilet and flush! We chose to make our own flannel inserts because it was free! My mom gave us two large old flannel sheets, we just cut them to size. If there’s no poop in the diaper it gets thrown in the bucket with everything else, washed and reused. 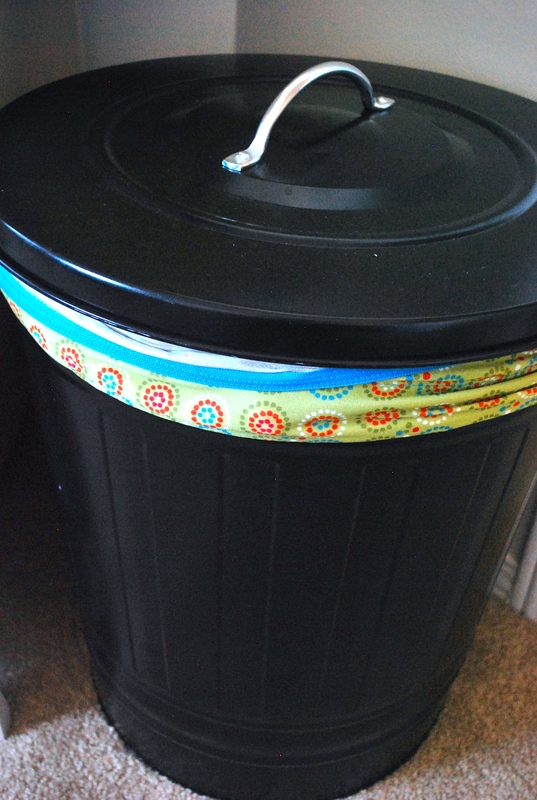 If there’s poop we use a plastic grocery bag (kept in a bag hanging on the right side of the table), tie it tightly and throw it in a small bin right behind the black bin. I empty that once a week and have never had an issue with smell. When he goes to a day home we’ll buy flushable liners to send with him, but for now this works and has no cost associated with it. We also chose to use reusable wipes, again because it’s far more affordable, and because there are no chemicals or irritants so it’s better for babies skin. I splurged on a Prince Lionheart Wipes Warmer and really love it, I’m glad I spent the $50, especially in the newborn phase when Ezekiel hated being cold. We chose Bummis brand for really no other reason than they were the most affordable. It had been recommended several times to try out a few brands, but honestly we didn’t have a budget to buy anymore than we absolutely needed and it really worked for us. 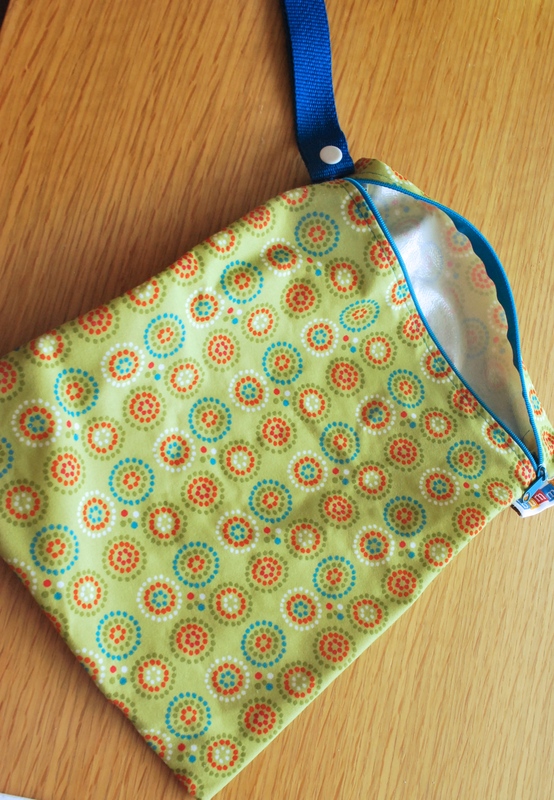 We use the Super Brite line and love them (although I think that line is being discontinued). We haven’t spent more than $300 on diapers, and accessories thus far, and probably have no more than $100 left to spend on bigger sizes and these will be used for all our kids! We bought one large wet bag to keep at home, and one small one to keep in the diaper bag. We haven’t purchased anymore and they have held up fantastic! That black bin is from Ikea and the large bag fits in it like a dream! It was a match made in heaven and a total fluke that I even found it! With the lid closed there is zero smell in his room which was my biggest fear going into this. The great thing about these particular diapers compared to the all-in-ones is that I can reuse the covers over and over. Generally I use 2 covers per day and rotate them. 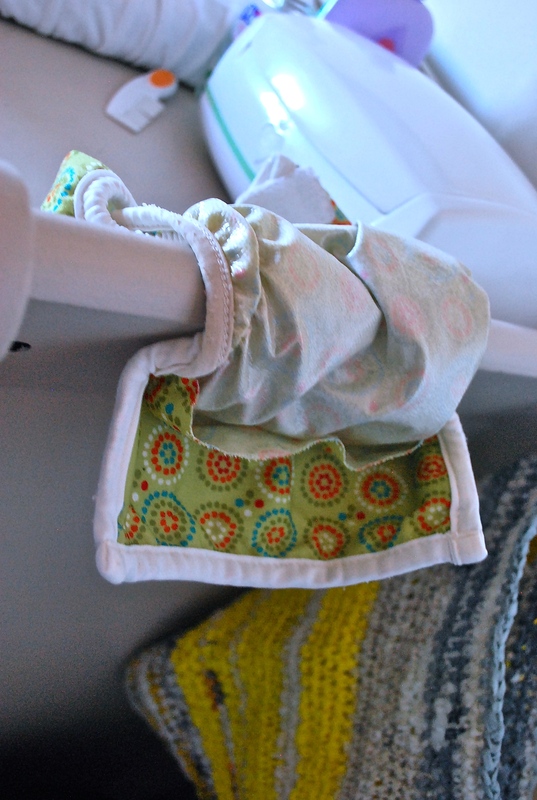 When one is used I just hang it over the side of the table to dry the elastics and the inside and use it for the next diaper change. When I’m done using one and want to wash it I just throw it in the bin. Some people prefer to wash them by hand to preserve the velcro but ours have held up fine so far. The washing of the diapers has never seemed like an inconvenience for me. I have enough diapers to last about 2-3 days, I usually wash every second day in the morning. It’s part of my routine to grab the wet bag on my way downstairs for breakfast. I buy the laundry soap from the same boutique that we bought the diapers from. 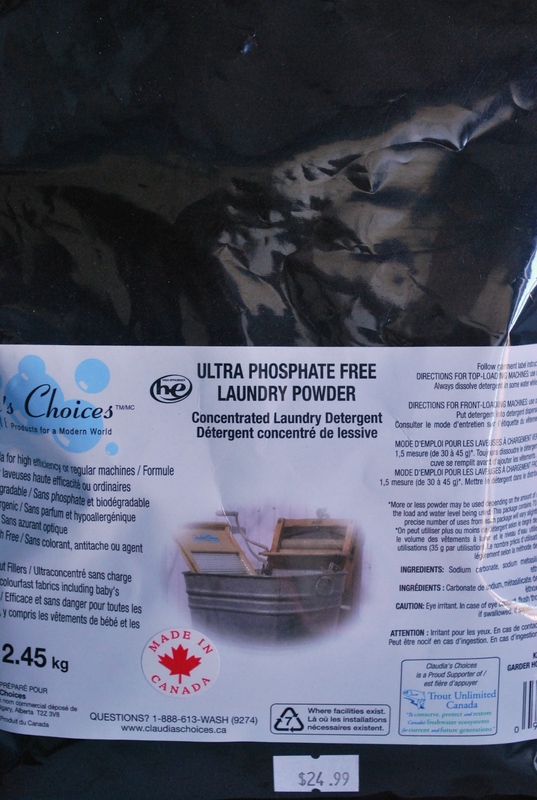 It has to be natural and phosphate free to preserve the absorbency of the liners. This is the second bag of soap I’ve bought since Ezekiel was born and it’s still over half full, you don’t need to use much at all. 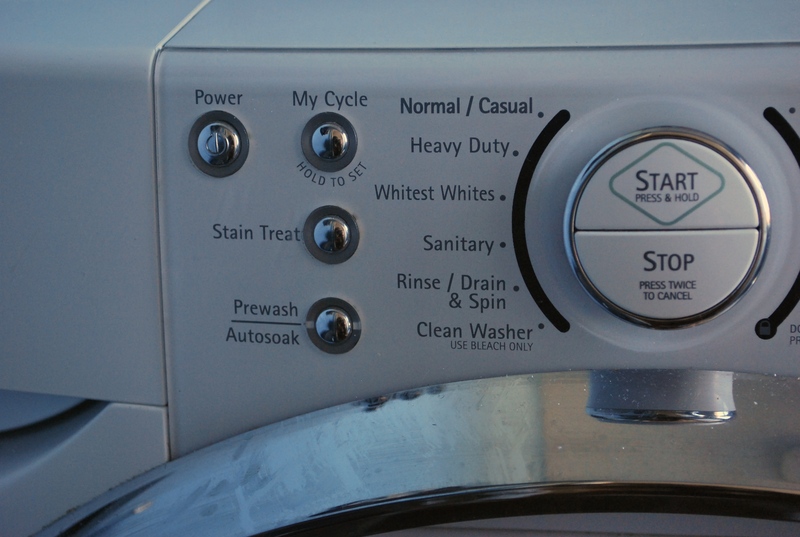 For the actual washing of the diapers I first do a rinse cycle with cold water then do a normal cycle with hot water and the laundry detergent. I’ve never hung mine to dry, always just used the dryer and have been fine with that. I’ve been using the infant size since Ezekiel grew to big for the newborn size, I should have sized up about 7 lbs ago but just haven’t got around to it. Ezekiel is a large baby (22.5lbs at 9 months) and is quite chubby around his legs and definitely has a ghetto booty! He does get a bit of a plumbers crack with this size right now, and we have to change him every 3 hours or he leaks, which I’m totally ok with. It is a sign that the diaper is too small when it’s leaking from the front, I figured this out when Ezekiel grew out of the newborn size. We have one larger sized cover that we bought accidentally thinking it was infant sized, we use it for overnight and just use two inserts and it works like a dream! I think that pretty much covers it. I can’t praise cloth diapers enough and would recommend everyone do them! I’ll be happy to answer any questions that you have, just leave a comment and I’ll get back to you.